I have had my Keurig 2.0 K200 for almost a year now, and I love it. It makes quick, great coffee, which is exactly what I need in the morning. 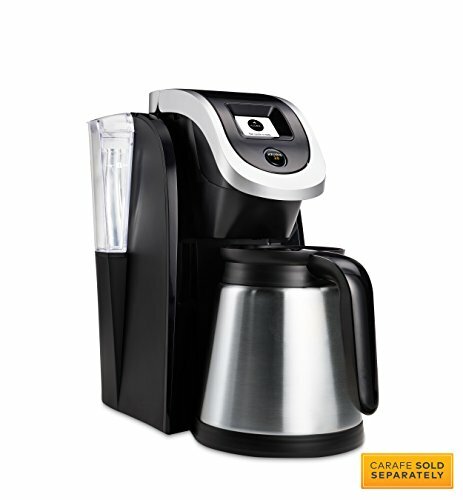 If you have the original Keurig and are looking for a little more counter space, the K200 may be for you. It is a smaller, more compact version of the original but it also has more bells and whistles than the original. In fact, the K200 is the smallest of the new 2.0 machines. It is much more narrow than the original; and while it is a smaller machine, the water level is still easy to see. The smaller size makes it great for dorm rooms, small apartments and condos, and even small offices. 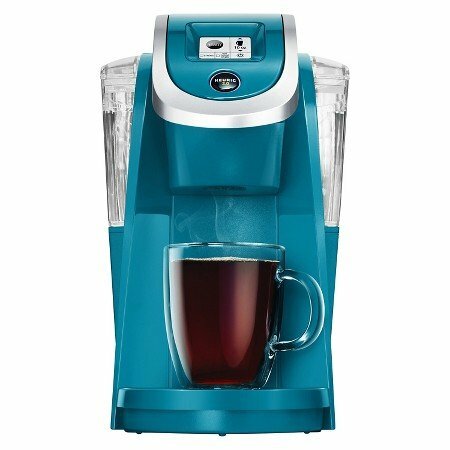 The Keurig 2.0 K200 is very simple to use; it has a water tank that holds 40 ounces, which is enough for a couple of days’ worth of morning coffee (or a day’s worth if you work from home…). If you purchase the additional carafe, you can make a 40-ounce pot of coffee. Note that the carafe is not included with the K200, but it does make a wonderful addition, especially if you prefer to brew a pot. The versatility is nice. It has an updated touch screen that makes operating it easy (I think my cat could do it…). The black and white display actually gives you step-by-step instructions, so it is the perfect choice for those who are new to Keurigs (also making it an excellent gift idea!). It has an onboard computer that can actually sense the K-Cup and brew it as a strong cup or a regular cup of coffee; either one will come out at about 180 degrees. It brews your cup in just two minutes. The K200 does not have a clock or timer, but since it brews your cups in just under two minutes, you really don’t need to time it. If you are like me, you want to know how difficult the machine is to take care of. It’s not difficult at all, really; cleanup is a cinch. The needle does need to be cleaned occasionally, and you can watch a ‘how to’ video on Keurig’s website. Other than that, cleanup is really not that hard. Just keep the drip tray clean by removing it and hand washing it (don’t put it in the dishwasher). Remove the reservoir and lid and again, wash by hand. To keep your brew basket clean, you can perform a ‘water only’ cycle by lifting and lowering the handle, without a K-Cup inserted (of course, you’ll still need to put a coffee cup in the drip tray to catch the water). If you love tea, that ‘water only’ cycle is the perfect way to get a hot cup of water for tea bags or for a cup of hot water with lemon. The Keurig also comes with water filter and a sensor that determines when it’s time to change the filter. The sensor also lets you know when descaling is needed (another cleaning process, but you can purchase descaler from Keurig and the packets have directions right on them). Oh, have I mentioned the coffee tastes great? I love it! I actually use this machine daily and love the coffee and tea that I brew. It makes delicious hot chocolate, too, and has a separate setting just for cocoa. Since you can control the coffee strength, it’s the perfect choice for those who need strong coffee in the morning, but maybe prefer something a bit lighter in the afternoon. While the original machine only came in black, the new K200 comes in a wide range of colors, so you can choose a color to complement your kitchen (or dorm room). The 2.0 comes in black, white, sandy pearl, violet, red, turquoise and ‘serenity’ which is a blue color known as one of ‘Pantone’s Colors of the Year’. I like the violet, but my favorite color is purple, so I’m biased. 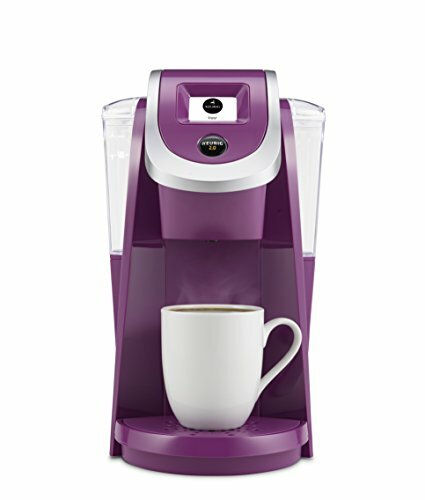 Depending upon where you purchase your Keurig 2.0 K200, the prices may vary by color. There is one thing that many people complain about when it comes to the Keurig 2.0 K200: you cannot use your old K-Cups (assuming you are switching from an original Keurig to the 2.0). You can only use the new Keurig K-Cups specifically made for the 2.0. These have a silver rim that the onboard computer reads to determine the type of coffee, tea, or cocoa you’re making; it will then determine the correct amount of water needed to brew that beverage correctly. Neat, huh? I have heard that there are some ‘hacks’ which people have come up with to use non-branded coffee in this model, but I’ve not tried any of them. Keurig says there are other manufacturers’ brands that are compatible, but they don’t say which ones. Another thing that some people get ‘steamed’ about is the fact that you do have to wait for the 2.0 to preheat. Before you can press the start button and actually brew your coffee the machine must be preheated. The preheating process takes about a minute, so I usually preheat and do other things in the kitchen or feed the cat. As I said before, the K200 will heat your coffee to about 180 degrees. I know many people like really hot coffee and may have to resort to microwaving their cups. And if you let your cup of coffee sit, obviously, it will cool off (so head to the microwave). Another ‘con’ is that the Keurig 2.0 does not turn itself off, as other Keurigs do. However, it has an energy saving mode that you need to set up. This solves the powering off problem nicely. Or, you can just turn it off. The 2.0 has brews sizes of 4, 6, 8 or 10-ounce cups (or a full carafe). I know a lot of people prefer a larger cup of coffee, so that has many people up in arms. I am fine with it, I just make another cup. It does make a little noise as it heats up, but overall it is pretty quiet; much quieter than most good coffee makers I have been around. Finally, in the ‘con’ category, the K200 filters are not reusable, as they are with other Keurig models. This is a bit wasteful and since they are not recyclable, this is a cause for concern. We can only hope that Keurig is looking to change this. The K-Cups are recyclable only if you separate the components, and that has been a hot topic for a while now. 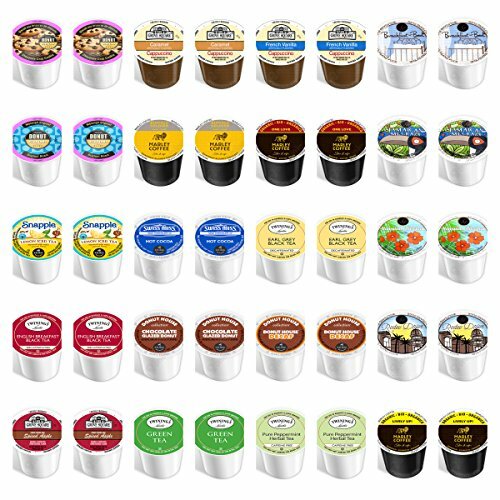 Your K-Cup pods consist of plastic, aluminum, coffee grounds and a paper filter. While you know all of these items can be recycled separately, when you put them together into a K-Cup, as a whole, they can’t be. But if you take the pods apart and separate and sort the components, you can recycle and/or compost them. For me, the bottom line is the Keurig 2.0 K200 is one that I have been using for a while now, so I am used to it. I love that it knows what K-Cup I have inserted and it knows just how to brew it. I love that I can brew hot chocolate; I love its space-saving footprint, and I love the purple color! It does make a great cup of coffee, and, like all Keurigs, it is very handy to have around. I know that we all have our favorite machines, but this is definitely one of mine. I will keep giving it as a gift to those who are new to Keurigs and to those who live in small spaces!